A Puerto Plata vacation package might just be the most affordable and appealing way to escape to the islands. The golden-sand beaches and deep, turquoise Atlantic waters of the northern coast of the Dominican Republic are a great place to launch a myriad of fun-filled daytime activities. Couple that with a wide variety of beachfront, all-inclusive resorts and unique cultural options; add a dash of lively nightlife with casino action and you have Puerto Plata! 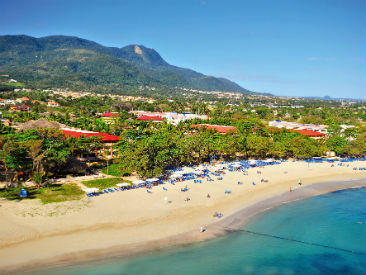 Favored by Canadians and Europeans for many years as a popular vacation destination, Puerto Plata has a distinctly European feel and flavor which adds to its appeal. The town of Puerto Plata, surrounded by a spectacular mountain range, offers old-world charm blended with seaside appeal. Puerto Plata hotels appeal to all ages, from couples and families, to the young water-sports enthusiasts looking for the perfect place to try out the hottest kite-surfing equipment! 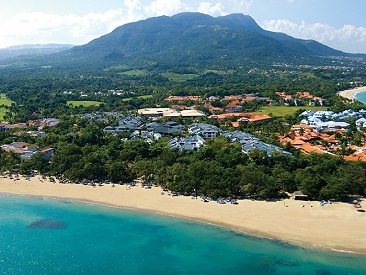 Sunscape Puerto Plata Dominican Republic is a family-friendly, all-inclusive resort located on one of the most famous beaches in Puerto Plata, Playa Dorada Beach. This resort offers spacious accommodations featuring private terraces, kid’s amenities, land and water activities and a variety of dining options. 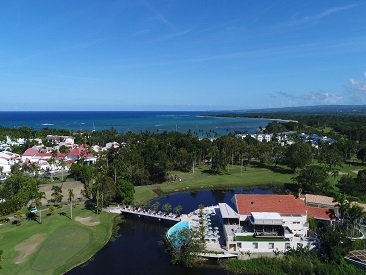 This 16-building resort is surrounded by a beautiful, lush golf-course surrounded by an 18-hole golf course designed by the one and only Robert Trent and is set on the gorgeous beaches of Puerto Plata. Sunscape Puerto Plata offers guest and Unlimited Fun® experience which includes 24-hour access to food and beverage options, endless daily land and water activities, live music and so much more! 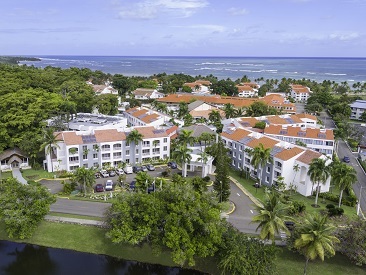 Playabachata Resort is an all-inclusive, family-friendly mega resort, situated on the exquisite beach of Maimon Bay, Puerto Plata in the Dominican Republic. Boasting breathtaking panoramic views of verdant mountains and lush, tropical gardens, this resort's spacious guestrooms display classic tropical décor in a beautiful setting. Guests of all ages can enjoy an abundance of land and water sports, as well as a variety of fun, organized daily activities and games. Children will love the kids club, complete with supervised activities and their very own splash pool. Dining options are in abundance, with buffets, snack bars and à la carte specialty options, offering sumptuous Dominican and international cuisine. Boasting fun for all ages in a spectacular, natural setting, Playabachata Resort is the perfect place to experience an unforgettable vacation in Puerto Plata. 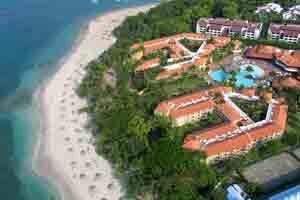 VH Atmosphere is an adults-only resort in Puerto Plata, along the northern shore of the Dominican Republic. With 2 pools, a beach club, 3 restaurants and 6 bars, this resort is the perfect retreat for couples or singles looking for an exciting, yet relaxing getaway. Situated between a 2,400-foot high mountain and the beautiful sea, this resort offers immaculate green lawns and tropical gardens. Facilities include a supervised, air-conditioned children's club and pool, the Be Relax spa and fitness center, a large theater, shops, water sports galore and dining options for all ages. 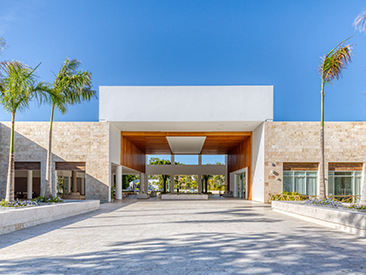 A sleek, spacious, 506-room, all-inclusive resort with an enviable location on the golden sands of Playa Dorada. The all-inclusive amenities include all meals and beverages at a variety of restaurants, snack shops and bars, as well as many activities and entertainment. Located 15 minutes from Puerto Plata International Airport, Emotions by Hodelpa Playa Dorada is an all-inclusive, family resort in beautiful Puerto Plata. 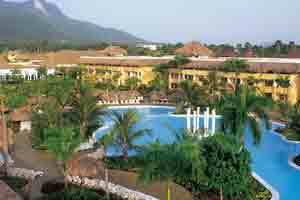 This resort is set on the largest beach front in Playa Dorada and is bordered by the Playa Dorada Golf Course. Emotions is the ideal getaway for travelers of all ages looking for adventure or relaxation. At the Viva Wyndham Tangerine, discover an outdoor playground along the stunning North Coast shores of the Dominican Republic. Satisfy cravings for thrilling entertainment with a variety of all-inclusive activities and services. With 273 stylish guest rooms and three suites, Viva Wyndham Tangerine is a perfect getaway for long days of sun-kissed adventure. 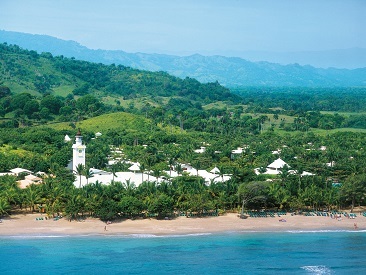 Viva Wyndham V Heavens Resort is a beachfront, all-inclusive, adults-only resort located on Playa Dorada Beach in Puerto Plata. It offers days filled with freewheeling fun in the sun and pulsing nightlife after dark.This newly remodeled resort offers a variety of amenities including spacious rooms and suites, live entertainment, on-site spa and a wide range of indoor and outdoor activities. Your Viva Wyndham V Heavens room is the ultimate, ultra-comfortable sanctuary to rest and recharge. Room design is defined by simple, stylish, elegant furnishings. All rooms feature a thoughtful and complete array of in-room amenities, including Wi-Fi. Located on a coral beach, with stunning mountain views and surrounded by a tropical garden. 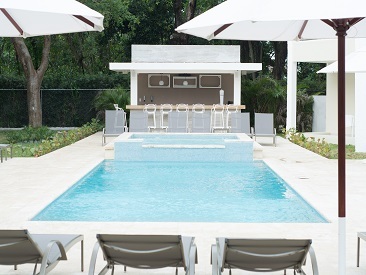 Senator Puerto Plata Spa Resort is the all ideal vacation spot with the best all-inclusive Premium style while letting adults and children coexist in a sophisticated environment of luxury.